Louis Spohr, violinist, composer and conductor, was born on April 5, 1784, in Brunswick, Germany and died on October 22, 1859 in Kassel, Germany. He was considered to be one of the leading composers of the late Classical (1750-1825) and early Romantic (1825-1900) Periods in music and was very successful and well known for his Operas (13), Symphonies (10), Violin Concertos (15) and Chamber Music, especially his String Quartets (almost 80). Spohr is often credited as being one of the first conductors to use a modern baton - rather than just employ his violin bow (with violin at the ready - in case of emergency). Today, however, only his 8th Violin Concerto remains popular and Spohr is mainly remembered for his compositions for Clarinet. In addition to the 4 Concertos in this collection, he also composed Variations on a Theme from Alruna (1809) and Potpourri in F Major (1811, Op. 80), both for Clarinet & Orchestra and Fantasia and Variations on a Theme of Danzi (for Clarinet and String Quartet, 1814, Op. 81). All were written for German Clarinetist (Johann) Simon Hermstedt (1778-1846), as was Carl Maria von Weber’s (1786-1826) Grand Duo Concertant (for clarinet & piano, 1816, Op. 48). The Duke of Sondershausen hired Hermstedt to form a wind band in 1801 and he remained in the Duke’s service until his retirement in 1839. The Duke first commissioned Spohr to compose for Hermstedt in 1808; Spohr and Hermstedt had met earlier that year at a concert and had performed Mozart's Clarinet Quintet, K. 581 the following day, with Hermstedt on Clarinet and Spohr on first violin. Spohr’s Clarinet Concerto No. 1 in C Minor (1808, Op. 26) turned out to be so difficult that in order to make its performance possible, Hermstedt had to actually add new keys to his 5 key clarinet, using a 13 key instrument, similar to Iwan Müller’s (1784-1854) simple system of 1809. This Concerto was first performed on June 16, 1809 with Spohr conducting. Spohr later admitted that when he composed the concerto he knew nothing about the Clarinet but its range and wrote as if it were a Violin, including impossible trills, extreme bravura and agility in the highest register. In his preface to the first edition of the Concerto, he refers to the Clarinet as “surely, the most perfect of wind instruments” (adding the qualifier: “if played as Herr Hermstadt does”). Clarinet Concerto No. 2 in Eb Major (1810, Op. 57) is the only one of the four that is in a major key, it is also the longest. Both Clarinet Concerto No. 3 in F Minor (1821, Wo. 19) and Clarinet Concerto No. 4 in E Minor (1828, Wo. 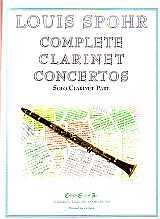 20 - for Clarinet in A) were not published until 1885, after Spohr’s death and, therefore, do not have Opus Numbers (Wo stands for without opus).